The world of wine is constantly changing. It’s one of the things I enjoy most about wine, however that can be confusing for some wine drinkers. Each year I do a wine blog on information I have read from wine experts around the world, predicting what the upcoming trends will be. Trends can come and go, so don’t feel bad if your taste in wine stays the same. Just so you know, I get this information from several sources, and put it together in what is, hopefully, an easy-to-read wine blog. The more people drink wine, it seems the more they want to learn about wine. I am constantly being asked to host at-home wine tastings so that people can learn more about wine. Wine tastings give people the opportunity to try some different wines that they may not normally buy. I read an article this past week that said my home province of Nova Scotia has more Sommeliers than any other province in Canada. Isn’t that great! And, fingers crossed, I will graduate and join those ranks in April. And more knowledge doesn’t have to mean accredited Sommelier, it can be as simple as learning more information about your favorite wine or the region it comes from. For many people it’s discovering what they like about their favourite wine so they can try new wines that are similar. I read an article in the past few weeks that says ‘on-site’ wine drinking is seeing a bit of a decline, while liquor stores and wine stores are seeing an increase in sales from year to year. So we are drinking less in restaurants, and more at home. And it makes sense. First of all, Congratulations if you don’t imbibe while out and about. That way you don’t have to worry about the drinking and driving. I think there was a time in the past many people felt a couple of drinks wouldn’t hurt and they were still safe to drive. I think people are becoming more and more careful when it comes to drinking and driving. Plus eating out can be expensive. Even among my group of friends,I notice we get together for dinner’s in one of our homes, as opposed to going out to a restaurant. I think more and more, people are entertaining in their homes. It’s cozier, more intimate, more relaxed and definitely easier on the pocketbook. I write quite frequently about Red blends, I personally am a big fan. The mind shift of ‘blends’ is changing and blended wine sales grew by over 10% in 2015. There was a time many years ago, a blended wine was considered a lower quality. This is no longer the case, as quality vineyards and qualified winemakers are putting out spectacular wine blends. And it’s interesting to note in the United States, for a label to carry just one of the grapes, it doesn’t necessarily mean there’s just that one grape in the bottle . For example, for a label to say ‘Cabernet Sauvignon’, there must be at least 85% Cabernet in the bottle, and 75% of those grapes from the region stated on the label. The other 15% of varietals can be made up of a combination of grapes ‘blended in’. In Oregon, that percentage must be 95%, and 100% of the grapes must be from Oregon. And different countries and different regions have different labelling laws. I’m telling you this so you realize you could be drinking a blend and not know it, because the manufacturer is just listing one grape on the front of the bottle. Here are some of my favorite blended wines. I couldn’t ignore it. Believe me, I tried. Several articles are listing one of the hot trends for 2017 is wine in a can. I’m sorry, let me rephrase that. Increased sales of wine in a can. 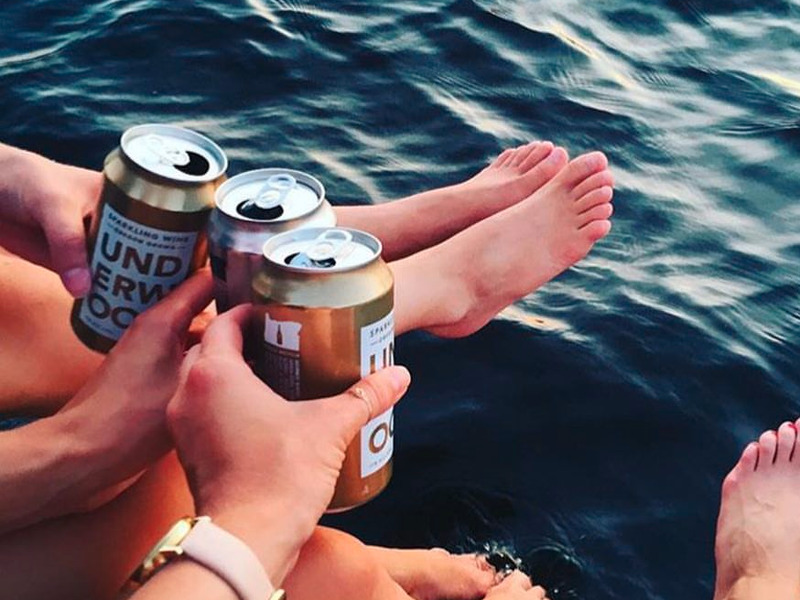 Wine in a can is already a thing. And they say you are going to be able to get good wine in a can. If it comes to Eastern Canada, I will be trying it. Canned wine sales doubled last year. People are looking for convenience, and since Millenials are going to be playing a huge role in the world of wine, apparently they are not drawn into the romance of popping a cork. They would just as soon pop the tab of a can. The Tallimba Grove Uncensored Shiraz hails from Australia and it is very very good. It has a price point of about $17, and after tasting it I had to double check the price. It had been in my wine rack for a few weeks and I had forgotten the lovely price point. I know it’s only February but you may want to pick up a couple of bottles for when you start barbecuing. This is a great wine for all things barbecue. Rich fruit with spicy notes and a really nice lingering finish. Its my pick of the week. I think all of Canada is experiencing quite the cold snap and some nasty snowstorm is as well. Our friends on the eastern seaboard of the United States also had a rough week weatherwise. I thought this was a fitting end to this week’s wine blog. This entry was posted on February 11, 2017 at 1:47 pm and is filed under Wine. You can follow any responses to this entry through the RSS 2.0 feed. You can leave a response, or trackback from your own site. Great article! Like you, I have tried to avoid “canned wine”, but it seems to be such a growing trend. When you do try it, please, write about it, I’m interested to hear your take on it!